The first show for our brand new,Zangersheide-approved, stallion Bonaparte Z has arrived. Bonaparte Z started last night in his first show ever... and what a show! The stallion competition during the Winter Equestrian Nights is a very nice show, perfectly organised and so beautiful,... but it's not easy at all! The organizers of the Winter Equestrian Nights (WEN) had attention this year for the tiniest detail, this resulted in wonderful surroundings with perfect lights, perfect music and a perfect atmoshpere. Gorgeous for us, but often frightening for our youngest horses in show, with the result that only 5 combinations in the 4-year old competition were clear! Bonaparte Z, our stallion by Balou du Rouet out of Lux - Ramiro Z, was last in the ring. The young stallion was certainly impressed but jumped a super round and showed great quality over fence and finished with a clear round! Two minutes later he had to enter the ring again for the awards and he clearly enjoyed the attention! We would like to thank Frederik, Niels, Gert, Peter and Stijn for organizing this wonderful show! Thanks to Jeroen for the beatiful career start of Bonaparte Z! Thanks to Nyree for the super groomwork. Thanks to Schou & Skouboe for the confidence in us. And especially we like to thank all the breeders who came to see the stallions and for the positive feedback we received afterwards! 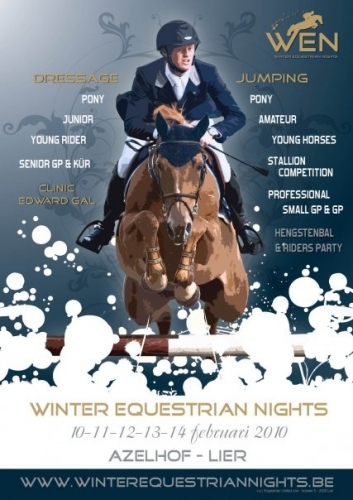 Winter Equestrian Nights, see you next year!